Natsume has been teasing multiple E3 reveals for titles on Nintendo systems, and has fired an early shot today with the announcement of Harvest Moon: The Lost Valley for 3DS, the newest entry in the series which will arrive — in North America at least — later this year. For its part the publisher is keen to emphasize that this new entry will be a step forward for the franchise, moving into a three-dimensional environment. Below is an excerpt from the press release. 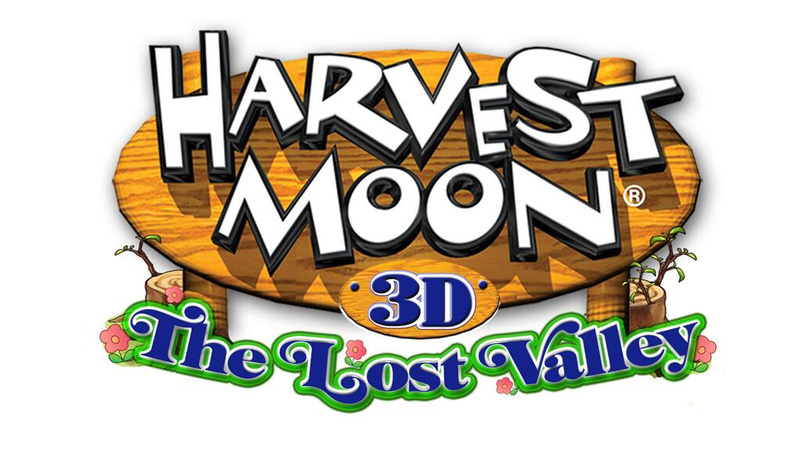 In Harvest Moon: The Lost Valley, players will experience the role-playing farm simulation in a three-dimensional setting for the first time. The game has a fully customizable world, and players can customize their field in any way they see fit: from a field full of tulips like you might see in Holland, to a valley filled with water like Venice, the choice is up to you. You've never played a Harvest Moon game quite like this! That certainly sounds promising, and the title will make its first appearance at E3. This may be seen as a blow to XSeed, however, which is releasing Story of Seasons in North America — that's actually Harvest Moon: Connect to a New Land by another name, as Natsume holds the rights to the Harvest Moon brand in the West. Now, bizarrely, the localisation of the previous release in Japan will go up against a brand new entry, each through different publishers and names. Publishing shenanigans aside, are you excited about a new Harvest Moon that promises to take the series forward? Let us know in the comments below. This is going to be really interesting. I can't wait to see what Natsume has in store. Wait so, a new Harvest Moon has already been announced, when the last one hasn't even come over yet, and it being localized under a different name and publisher besides? That is bizarre, but I'll take it. Is this an entirely new game developed by Natsume? Cannot compute. Why is a franchise competing with itself? What? Most importantly, WHY IS THIS NOT ON THE F***** WII U?! Yes! I love Harvest Moon! I'll be keeping an eye on this for sure! Well, I'm just gonna have to get both then! Natsume, bring Rune Factory to Wii U, please. I just hope it's not in a moé style. Don't get me wrong I'm excited about this but I'm confused with the press release here. Wasn't a new beginning in 3d? And it was customizable, although I guess technically not "fully customizable." And for that matter they've had console releases that were in 3d. Can't wait for e3, excited, just confused. Exciting news OMG can't wait for E3 now!! It's very odd that XSeed games and Natsume are both fighting to release the game. I think they should make a Wii U Harvest Moon next. I can see some major brand confusion happening when these two games are released. Anyway, I'm guessing the 3D part they're talking about means that the game will have a 3rd person view like the home console Rune Factory games instead of the usual top-down perspective. @ModestFan93 well yeah I get that it's just weird they're celebrating this so much. It'd be kind of like nintendo saying mario kart 8 is the first time it's been in 3d. We'd all be scratching our heads saying "um what?" Can't wait for it either way, I love sim games and love heavy customization. Edit: Ok, digging into the Natsume facebook page I got a little to think about. Natsume is not localizing but developing and publishing this game. They are making their own "Harvest Moon", and story of seasons will be the classic japanese Harvest moon. A 3D setting definitely interests me. Will watch this one closely. I'm not sure which one to get now. I was looking forward to the localization of Connect to a New Land but now this new new one The Lost Valley sounds intriguing. So... Natsume is going to develop their own game entirely now? @Ryno Natsume doesn't own the Rune Factory IP. That belonged to neverland which is not bankrupt. The dev team for Rune factory however, were hired by Marvelous. Natsume need to bring something to the Wii U, and fast. WE need it. Wait I don't understand are there two Harvest Moon games coming out or is the one published by Xseed just a clone? @HeroOfCybertron Xseed is part of Marvelous so if there is going to be a clone, it'll be Natsume doing the clone. But I doubt they can just do that so they are going to have to develop their own game. It'll be the first harvest moon game they actually develop. Wait, what ? Another one already ? The other one isn't even out yet.. @[email protected] Getting just slightly confusing. I don't feel like there's ever not been yet another Harvest Moon game on the horizon. @lunarkitty I have a feeling this is Natsume annoyed that it never got the rights to localize the last one so they are going to try and develop a new game to try and steal it away from Xseed. Hopefully this gets away form the New Beginning and Connect to a New Land style. NB was ok, but there was just way too much work withtoo little reward. I hope Natsume has been paying attention to all the goods and bads of previous HM games. I'm still a little confused, so there's Harvest Moon: The Lost Valley published by Natsume and Story of Seasons which is a Harvest Moon game but can't be called Harvest Moon because it's being published or localized by Xseed correct? @ikki5 you bring up some good points, way to ruin the mood haha! oh well. @HeroOfCybertron basically natsume never made the games, they only published them in the US. They were not allowed to publish the last game from Japan because the original developers of Bokujō Monogatari (the real name of what we call the original harvest moon franchise) gave the localization to xseed to bring Bokujō Monogatari to the US. Natsume only has the rights to the name "Harvest Moon" so because the made no money of the last Bokujō Monogatari, they are making a new game under their protected name. @HeroOfCybertron you see, harvest moon as a series is owned by Natsume, but up until now it was made up completely of translations of games in the Bokumono series owned by Marvelous. This is their first attempt at making a completely new and original Harvest Moon, and it will compete with Story of Seasons, which is the newest Bokumono game made by Marvelous. Man CoD can eat it the real battlefield is in the farm sim genre. Break out your pitchforks(literally) we're going to war over best farm sim. Guess I gotta pay attention to reviews to see which to get. Or I'll get both. Depends on when the release. Will the real Harvest Moon please stand up? I might get this if the reviews say it's okay when it releases. I've played Tale of Two Towns and a New Beginning. I liked Tale of Two Towns, but I was extremely disappointed with New Beginning, So Natsume will have to do a good job if they wanna get me to buy this. THANK YOU! I did not like NB either! If I get one of the 2 games, this will be the one. It sounds much more appealing. Next one needs a Wii U release though. I am interested in this, it sounds like it could be more or less a soft reset to the Pre-PS2/GC era games. (I count the GBA in the pre era). Two potentially solid games this year does sound good. @crzysortagamer @Moorpheel Ok thank you both for clearing that up for me. @Nintendo_Ninja I'd wait for the reviews. It may sound more appealing but you are looking at a company that has never developed one of these before. Also, Natsume is know for being kind of lazy especially when it comes to spelling. @CanisWolfred an October release date for Lost Valley leaked several months ago so it may be real. While Story of Seasons has a release window of just "next winter"
They couldn't wait until E3 for this announcement? That would have created a lot of hype! I guess that they wanted to get the info out of the way so that we wouldn't be distracted by Metroid Prime 4 or F-Zero U. That is awesome news! Looking forward to this! Been a fan of Harvest Moon since SNES so let's see what this is about! @Dragonxflame323 I know, i feel overwhelmed almost. a "harvest moon" from xseed and Natsume...which should i get?? @SphericalCrusher whats funny is.... this is not going to be the same Harvest Moon series that you loved on the SNES. It is a completely new series technically. @Moorpheel It's the other way around. The Xseed one IS Harvest Moon. The Natsume one isn't. Will the real slim shaddy please stand up. @Donjwolf Bokumono != Harvest Moon anymore. the xseed one is Story of Seasons (Bokumono in Japan), the Natsume one is Harvest Moon. It is a HM not developed by Marvelous, but it is a HM because Natsume is publishing it and Natsume owns the name. I am interested in both titles. I'm a huge fan of XSeed so Story of Seasons is really appealing to me. However, I'm also a fan of 3D Harvest Moon and I like that Natsume is interested in creating a game that gets back to the things that old fans enjoyed while also bringing in new elements, such as the field customization. Oh, who am I kidding, I'll probably get both >.> Though I'm worried that this "feud" will diminish the quality of the games. And confuse people. Harvest Moon is a series developed by Marvelous, however the Harvest Moon NAME is a western name used by Natsume for Marvelous's RANCH STORY games, the HM games we're familiar with. Story of Seasons is a Marvelous game published by XSEED, they can't call it Harvest Moon because Natsume own that name. The Lost Valley is a game DEVELOPED & PUBLISHED by Natsume, and they're using the HM name for it, but it is NOT a HM game as we know it. Story of Seasons will likely be the new name for HM in the coming years, unless Marvelous and Natsume get back together. But with Natsume releasing a whole new series using the same name, it looks unlikely. Just don't forget Europe please!!! Yep, if there were any chance of that its shot now, releasing their own home-grown "Harvest Moon" is be a huge "screw you" to Marvelous. Or it could also mean there wasn't any chance to begin with, so upsetting Marvelous isn't a concern for them. Gotta wonder why Marvelous didn't just use the name Ranch Story since its the intended name of the series to begin with. Searching for it even brings up Harvest Moon. I'm not sure what the better analogy is this situation: Wonder Boy (which Hudson released as Adventure Island and made their own sequels) or Robotech (an 80s anime localisation that glued 3 unrelated shows together to fit with US syndication needs of 5*13 episodes and so had plot edits, the original shows would not use the Robotech branding if they got localised). Still I wonder if the market can handle this many games and what the consequences could be. Worst case scenario is Natsume put out something terrible and nobody buys Story of Seasons killing the franchise in the west. Probably won't get released in Australia or Europe. Nintendo just does not care about us other 3DS gamers anymore. We have already missed out on Chibi-Robo's Photo Finder, Rune Factory 4 and Disney Magical World (and those are just the games [that I know of] that I thought would have been released just this year). I wonder if this will be any good? I guess I'll have to wait for the reviews to find out. Meanwhile I KNOW Story of Seasons will be good. Wow did X-Seed get Snookered? Anyhow I will more than likely pick the version which has the best online Co-op farming. I mean really where else is there to go with Harvest Moon than take it online? My money is on XSeed with online play. Natsume has shown over and over and over and over......'its not willing to take Harvest to a full co-op play format. Since XSeed is basically given that opportunity and had to drop the harvest moon name from the title maybe they are more free to do what they want too. Woo hoo! PAL Release Confirmed!